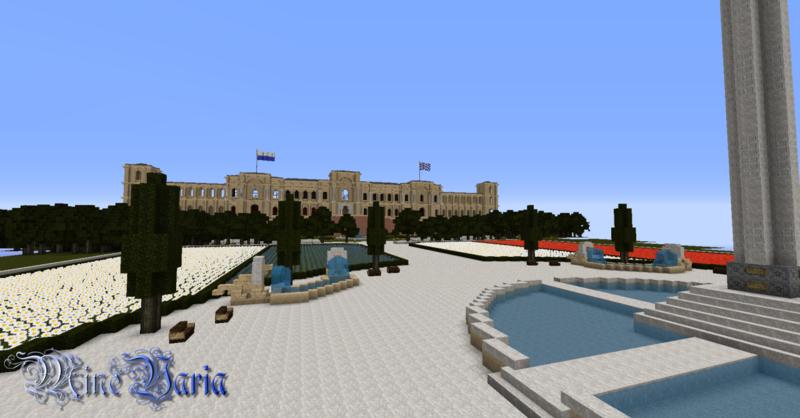 Klenzing is the capital city and political center of Minevaria. It's located to the north of Hefenberg. The name is derived from the two rivers Klenz and Klenzau. The architectural style of Klenzing is mostly (neo-)classical. The city is currently under construction. Four districts can already be visited, more are planned. The white city will shine again! True to this motto, even the south gate of Klenzing is splendorous. To both sides of the Bavarian Square, there are temples in Roman design, one for the Catholic god and one for Thon. The square and gate follow the example of the "eternal city": Rome. 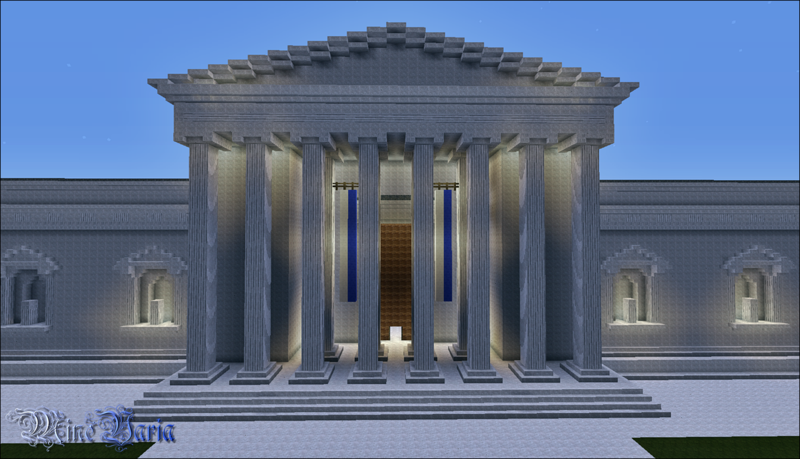 The district's most prominent edifice is the White Arena or "Colosseo Quadrato", inspired by Rome as well. West of the Bavarian Avenue between the Bavarian Square and the White Arena, there's a stable, a metro station, a post office and the Alte Münze. To the east, there's the group of buildings which gave the district its name: the gallery in the Marstall, the former Court Riding School of Munich, as well as the technological museum. The latter houses various exhibits which nobody interested in Redstone should miss out on. In the close proximity, there's a restaurant and the Museum Park. From the Museum District to the Wittelsbach District reaches the extensive King's District, in contrast to the cramped entrance in the south. The area houses a few park elements of the Villa Borghese in Rome and the Königsplatz in Munich. The latter provides the name for the district and consists of the Propylaea, the Glyptothek and the State Collections of Antiquities. To the east of the Königsplatz, there's the Theresienwiese along with the Oktoberfest. For what would Bavaria or Minevaria be without its Wiesn? Cheers! The Wittelsbach District is located north of the King's District and can be accessed through a bridge over the river Klenzau. The district is introduced by the Alley of the Hundred Wells, inspired by the Cento Fontane in Tivoli. A little further on, you get to Wittelsbach Square which is composed of the obelisk of Munich's Karolinenplatz and four flower beds depicting the flags of Bavaria, Franconia, Swabia and the Upper Palatinate. At the northern end of the square and surrounded by trees, there's the Maximilianeum, meeting place of the parliament. The Bavarian State Chancellery is also planned to be situated here. 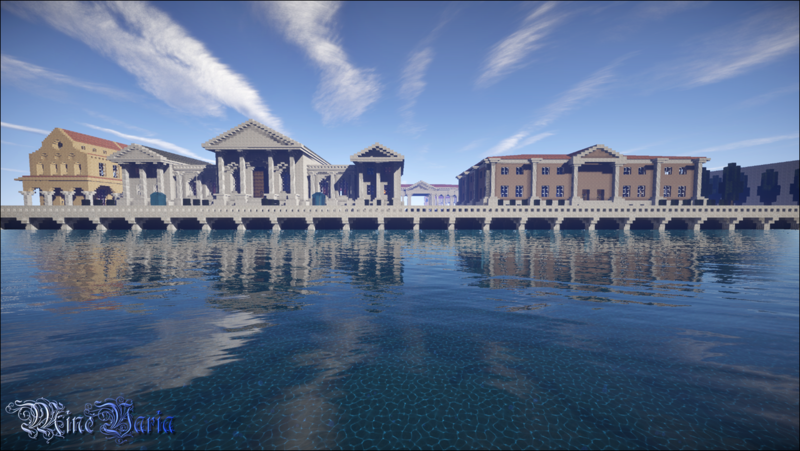 The harbor opens up a world without end, and the Bavarians' Forum, a classic interpretation of the baroque St. Peter's Square, connects it to the Museum District. The forum can house many market stalls to sell goods from all around the world. Furthermore, there are a port authority, a storehouse, and a lighthouse inspired by the Pharos of Alexandria. There's also a tavern, a classic fortification and a metro station around the Gärtnerplatz.